While many of us no longer create traditional scrapbooks and rely on digital solutions in the form of Pinterest, Facebook, and Flickr, there are still many examples from the long history of scrapbooking that need special care. At Heritage Protocol & University Archives, we use a variety of methods to preserve our large collection. We choose the best way to preserve while trying to maintain the original look and feel for the viewer. Some scrapbooks have a multitude of types of materials that need extra consideration. 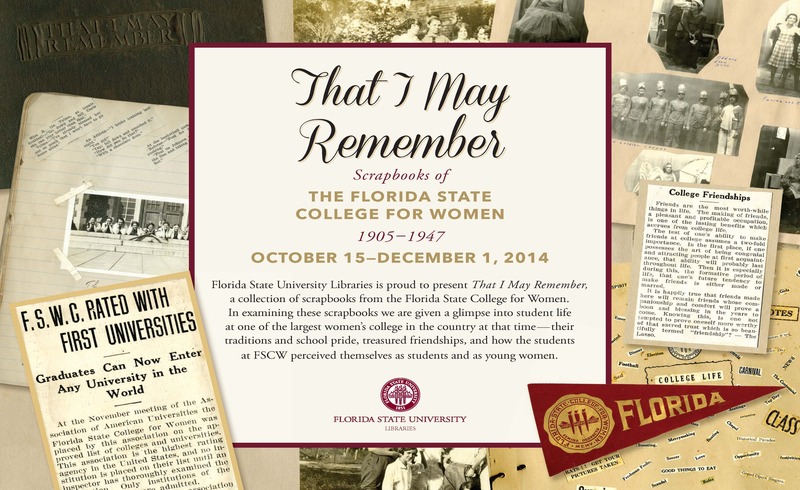 In the over 100 scrapbooks created by the Florida State College for Women and FSU alumni, we have found things such as bones, hair, fabric, dolls, jewelry, flowers and other plants, along with paper based memorabilia. This scrapbook has varnished wood covers that require special handling and usually a sturdy box. If the scrapbook is in relatively good condition (clean of obvious dirt and debris, dry, no mold, or obvious insect activity) wrapping gently, and/or boxing and storing in a cool dry place is a simple way to preserve.When tying with linen tape, we are careful not to tie so tightly that the covers or pages are damaged at the edges. I nterleaving pages containing photographs and other items with buffered or at least acid free paper can also provide stabilization. Cutting the sheet to fir the page and gently tucking it in works well. With photographs, a properly cut piece of buffered or acid free paper can be slid under it to create a barrier between it and the paper it rests on. There is still the matter of the photo corners, but some separation is better than none. If many additional sheets are needed, the spine of the scrapbook may not accommodate the extra pages. Scrapbooks that are too large, over-stuffed with objects (anything that exceeds the capacity of the binding) may need to be separated into parts, and either wrapped or boxed in sections to keep fragile items and brittle paper from falling apart. For albums with pages that are falling apart or otherwise in bad condition (bugs, mold, etc.) it may be wise to document the pages through scanning, photocopying, or photographing, and then remove as many items as possible and preserve them individually. Documenting the original order and other details of the pages preserves the context of items and the overall creation of the scrapbook, especially if there are notations or other items to preserve that cannot be removed easily. One method for removing old photos from paper and magnetic pages (sticky, striped backing), very gently saw back and forth with fine, waxed dental floss. These procedure are great tips for preserving your own scrapbooks, however removing items involves tools, patience, and a steady hand. The first rule of thumb with archival materials is to “do no harm.” If you aren’t sure what to do or aren’t comfortable with some of the more aggressive techniques, simply stabilizing your scrapbook is best (see interleaving and wrapping). If you are more daring, practice on something you aren’t attached to first. 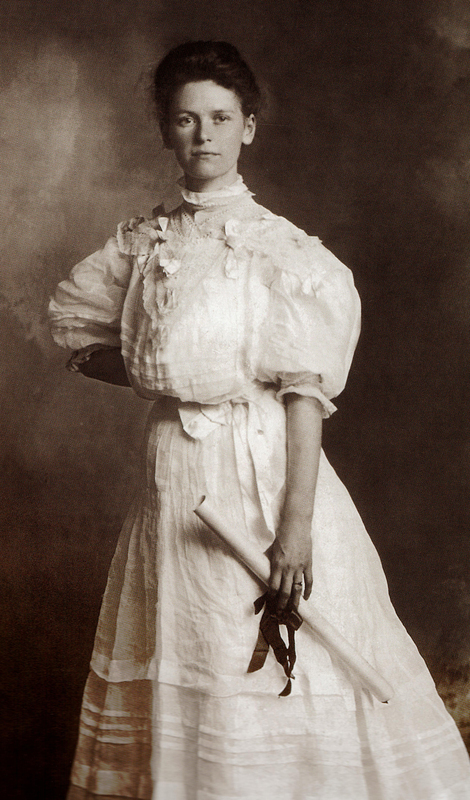 Ms. Nellie as she was often called, was one of the the first graduates of the Florida Female College, the year after Florida State College was changed from a short lived co-ed college to a women’s college due to The Buckman Act. Florida Female College was quickly renamed to the more fitting Florida State College for Women until 1947 when it became coeducational again and named Florida State University. Nellie spoke at the her graduation on Pestalozzi: His Influence on Public Education. She was married to Charles King, a teacher, principal, and superintendent of education for Jackson County, Florida. 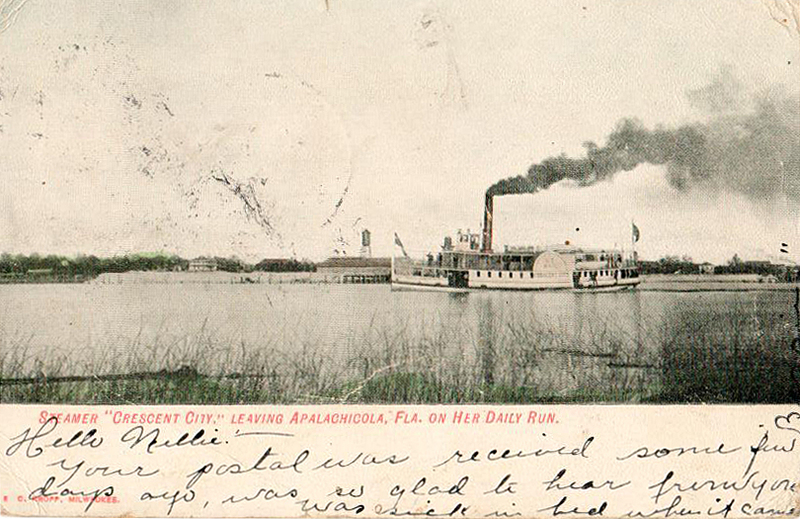 She was a prolific writer, and her over 1,000 letters and postcards describe her experiences in Tallahassee and surrounding areas, her relationships with family and friends from high school until 1940. …You ought to be here to see all these girls. I think there are eighty-five in the dormitories, and you can imagine how much noise they make sometimes. In the whole school there are one hundred thirty-three girls, and how do you suppose we answer the roll call? Mr. Kettle the secretary, gets up and says “roll call,” and then the girls say 1-2-3 and so on to 133. We had a very pleasant Thanksgiving, and had a delightful dinner, then held a little informal tea that night, and the girls all danced. Then Mrs. Bates invited us to her room and we had a little spread. You know we had lots of fun, all sitting around on the floor, singing songs, reciting, etc. 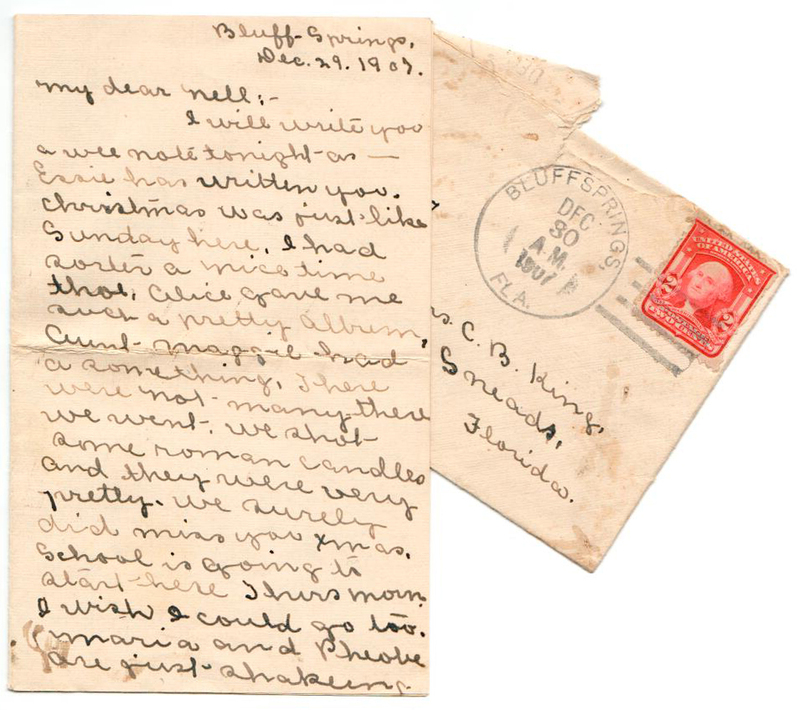 Heritage Protocol & University Archives acquired Nellie’s letters, as well as photographs and memorabilia as a recent gift from Leora Pruitt King, Florida State College for Women alumna Class of 1942. As a University Archivist, each day brings unique challenges, and every day is different. What most people don’t realize are the variety of duties, responsibilities, and actions that take place to keep everything moving forward to acquire, preserve, and provide access to Florida State’s historical collections. In the course of a week, a multitude of activities take place. Outreach is one of my main duties, and at the top of the list this week is printing and mounting all of the visual components, and then staging everything for our upcoming exhibit on Florida State College for Women’s Scrapbooks. For this project I also get to supervise and mentor two great graduate assistants, work on a postcard, reception, and logistics for all of that. Giving presentations and instruction to support classes on campus is another outreach activity. I presented on using our finding aids database Archon, how to find materials in the FSU Digital Library, and the important aspects of creating oral histories to ensure their long-term preservation and access. Students will make appointments and come in to meet with me and to look at primary resources for their projects. Their topic is FSU students and their experiences, right up our alley! I also spend time on ideas and posts for Facebook, and writing blog posts like these to get the word out about what we do. Every week I receive multiple requests for materials, most often images for use on the web, in print, and for events. The bulk of the requests I receive are from other departments on campus, especially administration. For example, University Communications contacted us to provide historic images for the President’s House that we will scan and provide for them to print. We have provided images for the scoreboard at Doak Campbell Stadium, for galas, for the newspaper, for student projects, and for local media outlets. To administer Heritage Protocol & University Archives requires quite a few meetings with groups inside and outside of the libraries. Meetings this week include those to discuss how our Special Collections & Archives reading room operates, how the libraries support scholarly communications, and how the University Archives will preserve all of FSU’s historic seals and logos.I also meet with other departments on campus about transferring their records to the University Archives, which acts as the official repository for FSU. Professional roles often cross over, and as President of the Society of Florida Archivists, my goal is to support the profession by collaborating with other archivist across the state and providing support to new professionals. In addition to my duties as FSU, organizing and planning activities for Archives Month this October, and our annual meeting next May in Miami, I stay busy, but also connected to other archivists and institutions across the state which in turn enhances my abilities at FSU. I also participate in different committees and activities related to the Society of American Archivists. Heritage Protocol and our entire community is saddened to learn of the passing of former Florida State University President and Trustee Dr. J. Stanley Marshall, who died earlier today, June 8, at the age of 91. From Garnett Stokes, Interim President, Florida State University: Dr. Marshall leaves a truly remarkable legacy. Following his service in World War II, he became an educator and statewide leader in higher education, earning an international reputation for his work in reashaping the education of science teachers. As an entreprenuer, Dr. Marshall lived an engaged life of excellence and integrity; and our faculty, staff and students are grateful for his leadership and influence on the Florida State University campus, as well as our city and state. While serving as Florida State’s ninth president, from June 1969 to August 1976, Florida State was known as the “Berkeley of the South” as student protests and faculty dissension placed the institution in the national spotlight. Notwithstanding the social and political upheaval of the time, he thoughtfully guided the university with a policy of “firmness coupled with fairness.” Because of this policy, campus protests resulted in arrests, rather than violence or casualties. In his 2006 book “The Tumultuous Sixties: Campus Unrest and Student Life at a Southern University” (Sentry Press), Dr. Marshall recounted how he was able to maintain order on the Florida State campus, while respecting the rights of free speech and assembly. Dr. Marshall joined our faculty in 1958 as head of the Department of Science Education, and adjunct professor of physics. He established the department of science education and programs to educate secondary school teachers in the sciences, and went on to become the associate dean of Florida State’s College of Education in 1965. 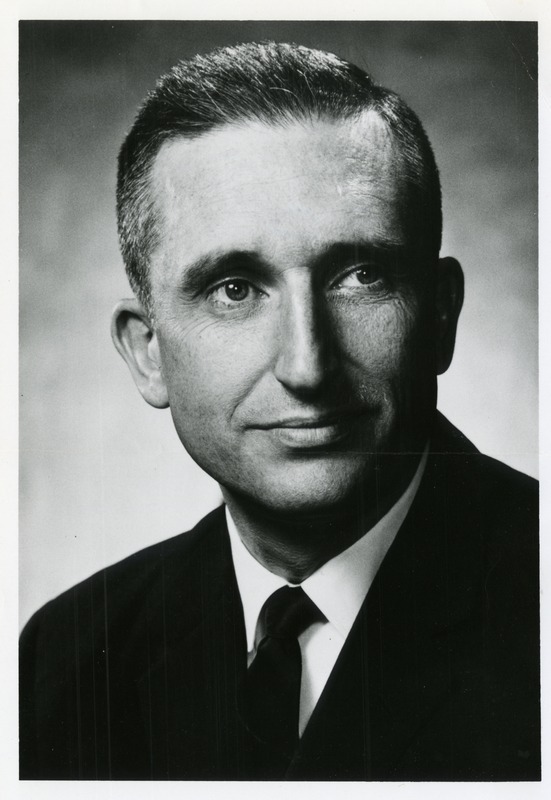 In 1967, he was appointed dean of the college. Consulting widely in science education, principally in the Middle East, Dr. Marshall gained an international reputation for his work in reshaping science teacher education programs. He was elected a fellow of the American Association for the Advancement of Science and served on that organization’s Commission on Science Education. Dr. Marshall was co-author of a widely used series of science textbooks for the elementary grades published by Scott Foresman. He was the Founding Editor of “The Journal of Research in Science Teaching” and served as an advisor to Encyclopedia Britannica Films, the National Science Foundation, and to the U. S. Department of Education. He served as President of the National Association of State Universities and Land Grant Colleges, Southern Region. By Presidential appointment, Dr. Marshall served for five years on the Secretary of the Navy’s Advisory Board on Naval Education and Training, as well as serving as an advisor to the Secretary of the Army for on-campus Army ROTC programs. He served as a member of the Board of Regents of The National Library of Medicine, and was a Fellow of The American Association for the Advancement of Science (AAAS), where he served on the AAAS Commission on Science Education. 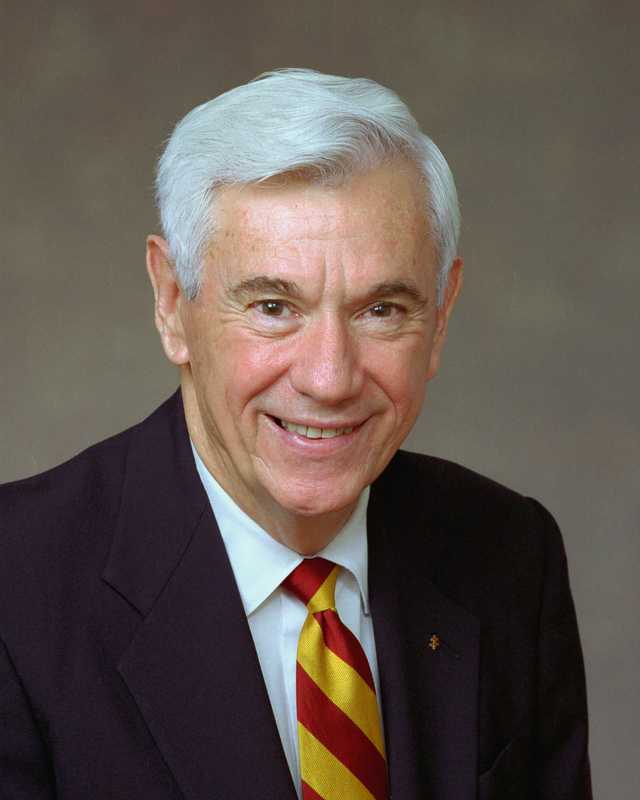 Dr. Marshall remained active in higher education following his retirement as Florida State president in 1976. He founded The James Madison Institute in 1987 and served as its President and CEO from 1987 to 2000. 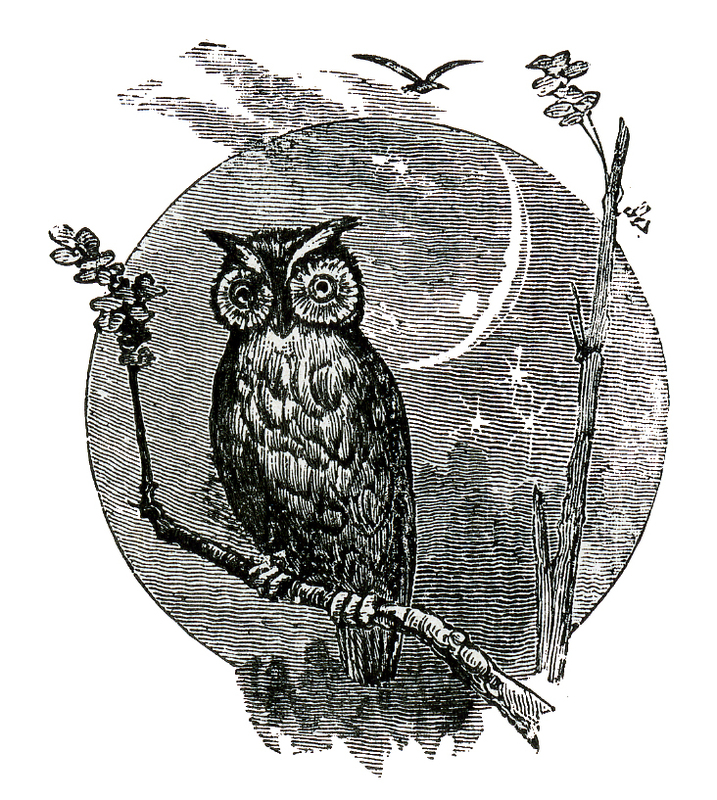 For many years thereafter he continued as Senior Scholar, publisher of the Institute’s quarterly Journal, and Vice Chairman of the Board of Directors. Later accomplishments include serving on the Bethune Cookman University Board of Trustees beginning in 1994, and concluding at the end of his four-year term as chairman in 2001. He also served on the Florida State University Board of Trustees from 2002 to 2005, and the Florida Board of Governors from 2005 to 2012. He later founded Sonitrol, a Tallahasee-based company that provides electronic security and fire protection for businesses and homes in the area. As a member of the community, he served on numerous commissions and boards, including the Florida Commission on Cabinet Reform in 1995, and the Florida Constitution Revision Commission in 1997-1998. In addition, he served on the boards of the Tallahassee Memorial Regional Medical Center and the Tallahassee Area Chamber of Commerce, and received the latter’s Lifetime Leadership Award. Dr. Marshall’s contributions to science teacher education and higher education are countless; and equally immeasurable is his legacy as a genuine “Renaissance Man” – a global reputation that was shaped by his extraordinary intellect and standing as a champion of objectivity and fairness. Our thoughts are with his wife, Shirley, their five children, and 13 grandchildren. A memorial service will be held on Monday, June 16 at 11 a.m. at Trinity United Methodist Church in Tallahassee. Today we are saddened to mark the passing of Reubin O’Donovan Askew, FSU alumnus, professor, and former Governor of Florida. Askew, born in Muskogee, Oklahoma on September 11, 1928, died early this morning surrounded by family members at Tallahassee Memorial Healthcare, he was 85. He served as Governor from 1971 to 1979 and as U.S. trade Representative from 1979-1980. 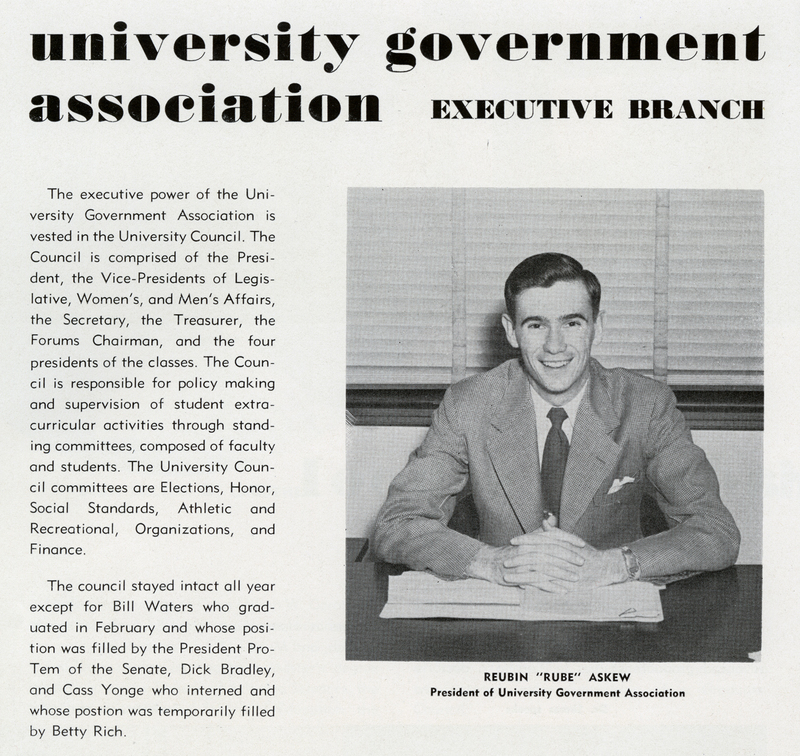 Previous to his long and eventful political career, Askew was an active student at Florida State. After serving in the United States Army from 1946-1948, he attended FSU on the G.I. Bill and became Class President during his sophomore year in 1949, a member of the University Senate in 1950, and as a senior, served as President of the University Government Association in 1951. Since 1995 he had been on the faculty here at FSU, and was also the Senior Fellow of the Florida Institute of Government. Since 2000, he was the Eminent Scholar Chair at the Askew School of Public Administration and Policy teaching Florida Government & Politics, and held 15 honorary doctorates from institutions around the nation. Askew was known as a champion for racial and gender equality and was the impetus for many “firsts” in Florida. He integrated the Florida Highway Patrol, appointed the first black Supreme Court justice of a Southern state, appointed the first black member of the Cabinet in over a hundred years, created the five regional water management districts, made the Public Service Commission appointed rather than elected, called for rehabilitation rather than the jailing of alcoholics. One of his most notable acts was to pardon Freddie Pitts and Wilbert Lee, two black men wrongly convicted by an all-white jury and sent to Death Row in the killing of two gas station attendants in Port St. Joe, Florida.